The Indigo Girls had missed a workshop session earlier in the day, due to a delayed flight, but if the experience left them harried or flustered, they didn't show it in the slightest. 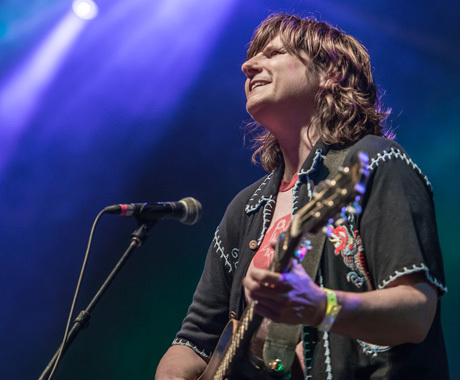 The duo, consisting of Amy Ray and Emily Saliers, were natural and naturally disarming, while still showing a level of professionalism and ease that can only come from almost three decades of playing together. While Ray and Saliers will still play with a full band on occasion, it's hard to see why their melodic folk-pop would need it. The stage was already full of sound. The two switched between a pair of acoustic guitars, a banjo, and a mandolin, showing off excellent skills on any one of them. They each took lead vocals on occasion, but that never stopped the other from joining in with expert harmonies. A knowing and appreciative crowd gobbled up hits like "Closer to Fine," but if anyone less familiar with the Indigo Girls was in the crowd — tentative hand raise over here — they should've been easily won over. Even as their songs seamlessly flowed into each other, they still managed to interact with the crowd with some endearing banter. At one point, at least one lady yelled "Marry me!" at the pair. Ray came back with, "Well, that's not legal in Georgia," with a bit of a laugh in her voice.